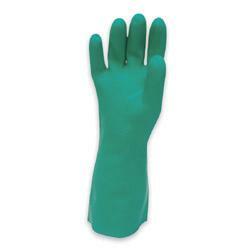 Nitrile disposable gloves offer far superior comfort plus extreme durability to latex gloves in many ways. The blue or purple colored nitrile gloves are made from 100% NBR nitrile butadiene, an advanced synthetic rubber formulation that’s completely free of skin-irritating proteins, silicones, or plasticizers. Nitrile disposable gloves contain no latex, which could create a latex allergy. These thermally-responsive gloves quickly stretch to conform to a hand’s contours in minutes, reducing fatigue on muscles and joints for a more comfortable fit than latex or vinyl. The surface of these gloves have a micro-textured surface for extra grip. They are three times more resistant to punctures, abrasion and tears than latex, and stand up to a wider variety of splashed chemicals, solvents, oils and base chemicals. Our Green Nitrile Gloves (not to be confused with our nitrile disposable gloves) are case-hardened to repel chemicals and are highly resistant to abrasion, snags, and punctures. An embossed diamond pattern on the palm and fingers give firm traction grip. They are available in both 11 mil and 15 mil thickness. The gloves are 13" in length and are powder-free. These gloves are sold in pairs or by the dozen.